With the iPad Mini fast becoming the tablet of choice for frequent flyers of all kinds, it was about time someone created a case that pushes productivity. Hand-stitched by the excellent Waterfield Designs of San Francisco, the Travel Express has space inside it not only for an iPad Mini, but a whole host of accessories, too. Measuring 266x200x40mm and weighing 244g, its main compartment can take an iPad Mini – either the original iPad Mini model or the iPad Mini 2 Retina is fine – even if it’s wrapped in Apple’s Smart Cover, or any other slim protective cover. We even managed to insert an iPad Mini 2 Retina while it was attached to our other favourite productivity gadget, the Logitech Ultrathin Keyboard Cover for iPad Mini. Sewn on to the main compartment are two pockets that are primed for travel documents – they’re exactly the same size as a UK passport. Two more pockets are provided on the other side, one that’s the exact size of an iPhone, and another that is just perfect for storing the kind of portable battery (LINK TO CATEGORIES!) that’s becoming so popular with long-haul travellers. There’s just about enough room to cram-in an Apple charger, too, though this is one concept that’s likely to work better for the bigger version – the Waterfield Designs Travel Express for iPad. It’s also worth knowing that the Waterfield Designs Travel Express for iPad Mini has a high quality zip and D-rings for attaching a shoulder strap to. 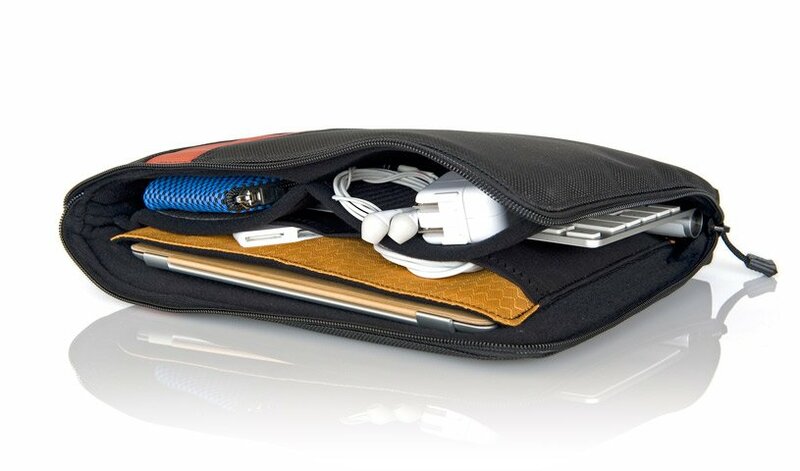 With flashes of black, green, red, copper, turquoise, pearl grey and brown Muzetto leather available for this otherwise black ballistic fabric case, it’s nevertheless some excellent functionality that impresses most about the Waterfield Designs Travel Express for iPad Mini. The exacting measurements of Apple devices and travel documents is especially clever, though it’s the shoulder strap that makes this perhaps the ultimate productivity solution for anyone wanting to travel quickly and hassle-free through airports and transport terminals – or even attending a conference.